How do you drink more water? I know there are some water haters out there. It isn’t that people hate water, but it is that they know they need to drink more - but don’t really love it. How much water do you need to consume every day to be healthy? Well, that depends on the amount of activity you do, where you live (is it hot? ), and how much you weigh. In general, you should try to drink between half an ounce and an ounce of water for each pound you weigh, every day. For example, if you weigh 150 pounds, that would be about 10-20 cups of water per day. I have found that when I drink that much water, I visit the bathroom far more often BUT I have more energy. You need water to help your body run efficiently and you can’t drink 10 cups all at once. Slowly, throughout the day, you sip it. But, what If you only drink 4 cups of water per day? How do you drink more? Check out these two older posts for some ideas - Top Eight Tips for Tastier Water and best fruit infused water bottle. These are my latest and favorite ways to drink more water. The first is Key Lime Juice! Who knew you could find this next to the lemon juice at the supermarket? A friend of mine introduced me to Nellie & Joes. He always puts a few drops of this zero calorie lime juice into his water bottle and I must say it is delicious. I love limes so this was an easy addition to my water routine. Nuun is a hydration solution (and it is kinda expensive) but I think it makes water easier to drink. 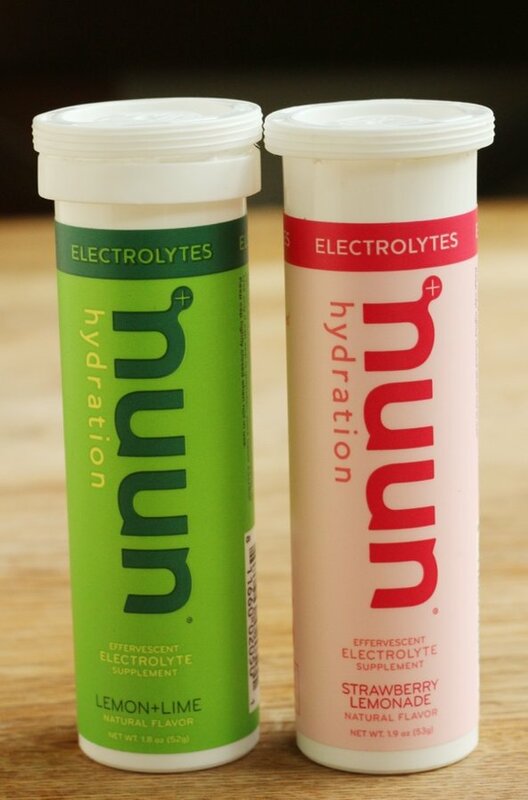 You pop a 10 calorie tablet into your water bottle and get a nice flavor along with electrolytes. I use this after exercise instead of drinking Gatorade. Also, I drink 1/2 coconut water plus 1/2 water as a rehydration drink. It is a bit fizzy, which also makes water easier to drink. My favorite option for drinking more water is the most expensive option but it may be worth it. I received this Hydroflask in the mail as a sample because I am Snack Girl. I was not paid for the below endorsement. Sometimes (rarely), I get something for free and love it! I must say that it immediately became my go to water bottle as well as my family’s first choice. This led me to buy two more so I could have one with me all day. It keeps my water COLD even when it is 90 degrees and the bottle sits in the car for 4 hours. I have the 21 ounce with sport cap and I love it - but it retails for $36 (ouch). How do you drink more water? Can you keep up? Do you find that you feel better when you drink more? Having COLD water makes it so much better. There are many hydro flask knock offs available on Amazon that are just as good for a third of the price! I have a goal to drink half my body weight in ounces every day. I am on day 7 and hanging in there. I am a traveling developmental therapist so finding a bathroom when needed isn’t always easy but I am making it work. I have been using the Water Tracker app by Grassapper. I love it! When I put my water in the app cheers and confetti is thrown on the screen. When my daily goal is met a song plays and it has been a different song each day so it is fun to see which song will be played. I have also started having 16 ounces of water before my coffee in the morning and I kee refillable 16 ounces bottles of cold water in the fridge all day. "Who knew you could find" key lime juice with the other citrus juices? Shoppers lucky enough to live in an area with a store that carries this pricy stuff that is not on the average shopping list. I drink bottled water. We get it when it’s $1.99 a 24 pack. I bring it with my lunch every work day. Water has been my beverage of choice since I was a kid. My mother could always get me to drink water but not milk. I have a 40oz Hydro Flask! I love it, but I want to get one with the sport cap like yours. I’m kind of a water bottle hoarder! Morning! Water was ansd is my biggest problem to drink. I but the bottled water and can drink 2 of them but after that I have a hard time. I will try the trick of adding lime juice to another bottle. 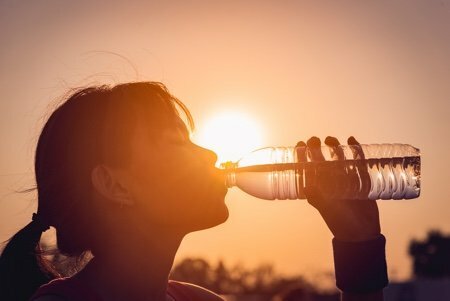 Most people (including myself) definitely do not drink enough water in the course of a day, and apparently this is can be common in elderly people, especially. Yes to drinking more water! Having said that, I just want to add one note of caution for people who may overdo it...please ask a professional before embarking on ‘water-bingeing’ since, after all the “hey it’s only water, so what can happen?” mentality could occur...There are documented cases of people who, believe it or not, ODed on water...albeit most of us are not likely to have this experience with water consumption, and the first time I heard about this I also thought it was pretty unbelievable. Snack Girl has recognized what we should do more of over the course of an ENTIRE day, not to be done all at once! The body is a delicate balance and drinking way too much in too short of a time could possibly cause a potentially fatal imbalance of minerals in one’s body, especially if this is taking place during a marathon or other extreme instance. Thank you for this post, Snack Girl, since many more of us need to drink (more) water than will ever overdrink it. I probably don't drink enough water either, but I want to say that HydroFlask bottles are the best! One of our field guys at work told me about them ... I tried one and I was hooked. I now own three in different sizes. They keep my coffee or tea hot enough to burn by tongue for 5-6 hours, and they keep my ice & water mixture cold for even longer -- even in my hot car. I've found ice still in the water after 24 hours! They're expensive but worth every penny! Thanks for the Hydroflask tip, I can think of a couple ‘hard to buy for’ people who would love this as a gift! I usually shoot for drinking half my body weight in ounces too. [Keeping in mind that much of my daily fruit and vegs count as some water too.] Two 10oz cups of green tea [1 bag] start my day. Whenever I enjoy a coffee I make up for it with equal water. When water bores me I add TruLemon in grapefruit flavor or pop a fruity tea bag in cold water, switching up flavors. Celestial Seasons carries a variety pack I found on Amazon but I'm always trying new ones. The usual fresh citrus wedges lemon, lime, orange and grapefruit are used whenever they’re on hand. A favorite of mine, even in summer, is hot lemonade with two garden herbs: mint & basil muddled a bit first. OMG it’s so refreshing and, I believe, detoxifying as well. These herbs together make for unbelievable natural sweetness. I use a Spark Hidrate bottle. It’s a little pricey 52$ but worth it. It lights up when you’re behind on ur water and a real light show when you hit your goal. It decides your goal daily by determining the temperature outside and humidity and your ground elevation. It’s so fun and rarely have I missed goal. I’m even on my 2nd bottle. It’s well worth the cost!!! My son gave me a soda stream machine for Christmas and it has really helped me cut down on diet coke and drink more water. I love fizzy and the soda stream machine lets me get my fizzy hit while getting more water. I don't even bother to flavour it- just drink the carbonated water and I really am drinking more water than I ever used to. There's a great free Apple Watch and iOS app that reminds you to drink water without tracking water intake. It's called Pee & See, and it's based on how often you pee instead of how much water you drink.